NATIONAL (VFB) — It’s official, Washingtonians are Feeling The Bern! On Sunday more than 60,000 people turned out to see Bernie Sanders at multiple rallies across the Evergreen State. The line at Bernie’s first event in Vancouver was, as expected, ridiculously long. 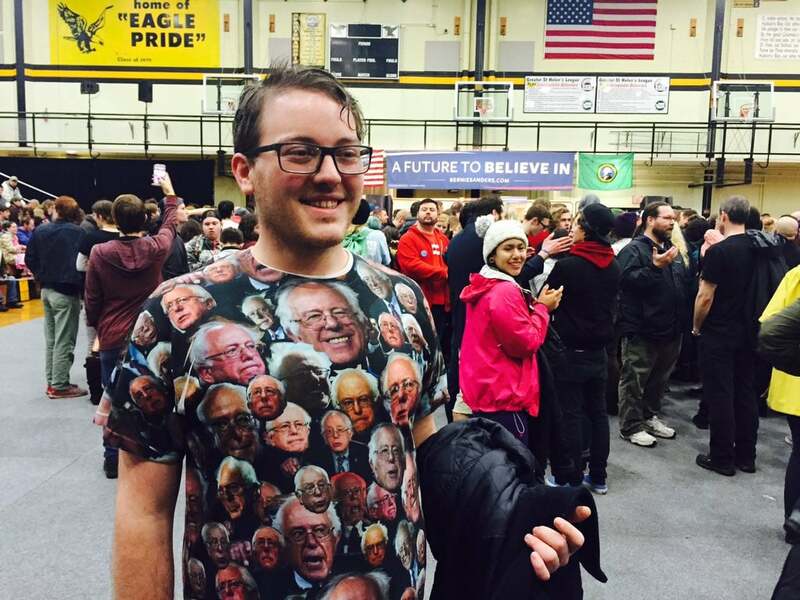 Enthusiastic Bernie supporters of all kinds turned out. John Horton sported a classic Bernie shirt. Sanders first addressed the overflow crowd, as has become routine, before heading inside. Inside, the gymnasium quickly reached its 5,000 person capacity. For some, seeing Bernie in Vancouver was a dream come true. Bernie’s Vancouver speech can be watched here. Next, Bernie headed to Seattle, where tens of thousands waited in the rain for several hours to see him speak.
.@CNN hey, just writing to let you know there are 30K people waiting in the rain to see Bernie in Seattle. Thought that might be newsworthy. Again, the line was ridiculously long. When the doors were opened, the excited crowd literally stormed the building for a chance to get a spot close to the stage. Bernie again addressed the overflow crowd before venturing inside. Another beautiful sea of people filled Seattle’s Key Area. Folks inside were fired up and ready to go! To accommodate the thousands who couldn’t fit inside, several exterior screens were set up to show Bernie’s speech outside. After Seattle, Bernie was scheduled to hold one final rally in Spokane. According to reports, people started lining up in for the Spokane rally at 2:30, over 7 hours before Bernie’s scheduled speech. By some estimates there were 12,000 people in line. As is customary, Bernie’s arrival was an economic boon for local merchants. Bernie's killing our economy. Every pot shop in #Spokane is empty right now. The Senator’s stamina did not go unnoticed by the People. Washington voters will caucus this Saturday, March 26. By the looks of it, Bernie Sanders should pull out a resounding victory.